22.06.2016. 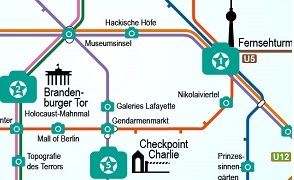 Berlin – The Berlin underground map shows the best photo galleries in the city. 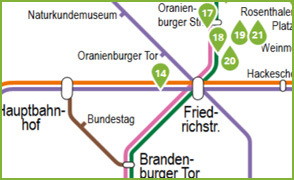 The top 25 photo galleries are displayed in the current Berlin underground and overground rail map. This means photography fans can plan their journey through the city’s photography scene and discover the modern photography. Included in the top 25 are exhibition hotspots like the Museum of Photography, Camera Work, and C/O Berlin, but also newer places like Silber & Sanz. 20.05.2015, Berlin – Planning a short trip to Berlin? The first-ever underground map specifically designed for sightseeing guides you to the most popular tourist sites. Here you will find the most photographed buildings and squares. Experience the city with the underground and overground rail system, and between the Reichstag and Mauerpark, make sure you don’t miss a single photo opportunity!